The right tools for the project! Track loaders, Excavators, Breakers, and more! 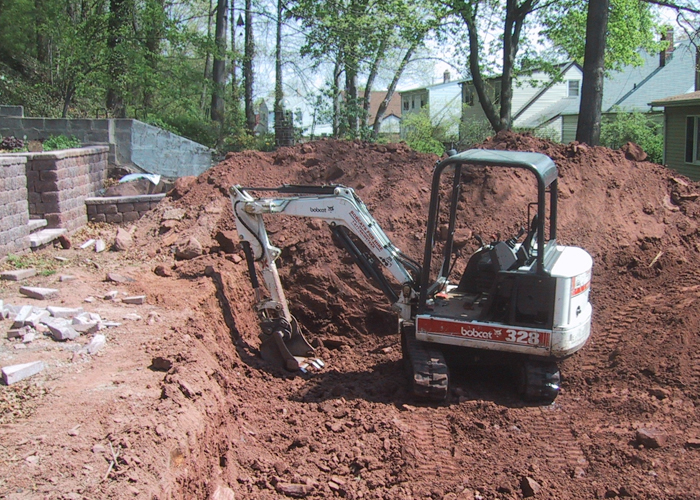 Specialized equipment allows for all of the excavation, grading, and drainage needs for your site. Our planned approach is sure to address the unique site conditions correctly which will save you time and money in the long run. All too often, decorative landscaping and hardscaping are installed without adequate thought to the long term needs of the site. Correcting drainage issues that should have been know AFTER the installation of patios, walkways, and ladnscaping, will always involve substantially more work than fixing the drainage issues in the beginning. Be smart and plan your project correctly. Your checkbook will thank you later. Compact, yet powerful for all your site work needs. 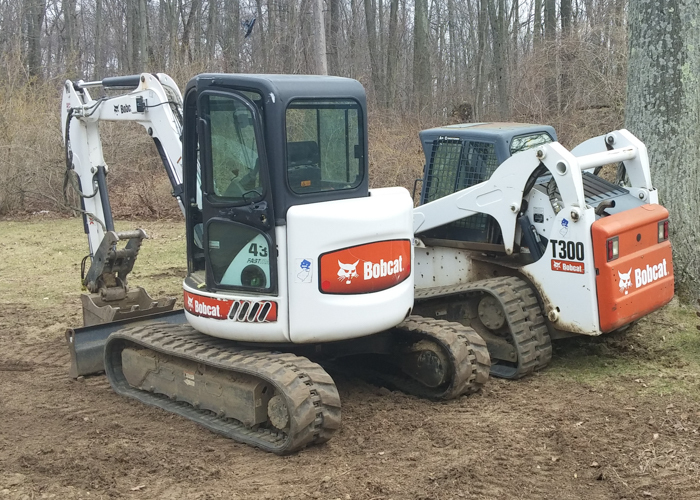 This pair of machines can usually be found on our jobsites from beginning until the end. Cutting through asphalt to install new drainage lines and catch basins. Our T300 Bobcat track loader is remote controlled. 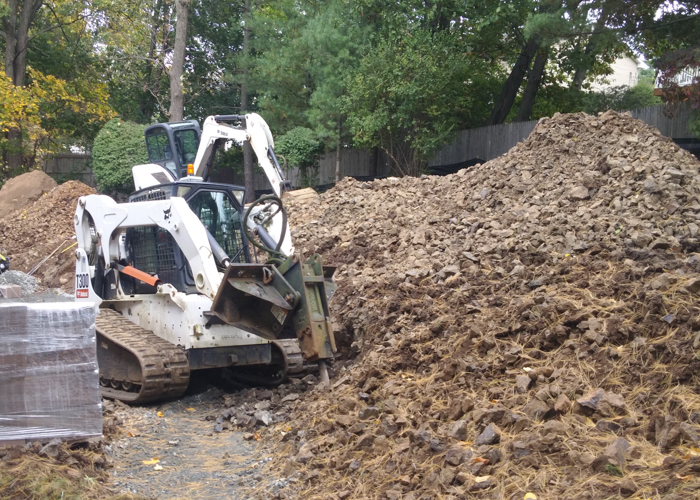 At this site, the T300 is being used to demo ledge rock that was in the way of our customer's installation of a Keystone retaining wall. The remote controlled bobcat with hydraulic breaker is chipping away at the rock to make way for the new landscape wall and patio. 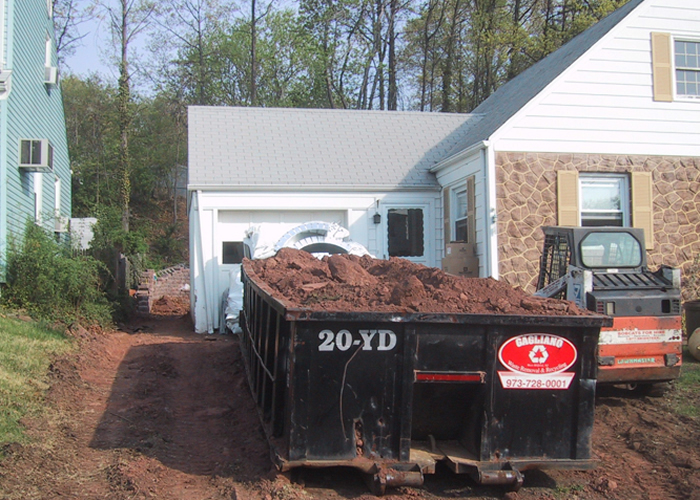 Exterior foundation waterproofing requires excavation down to the footing level to prepare for the exterior waterproof membrane and foundation drain. 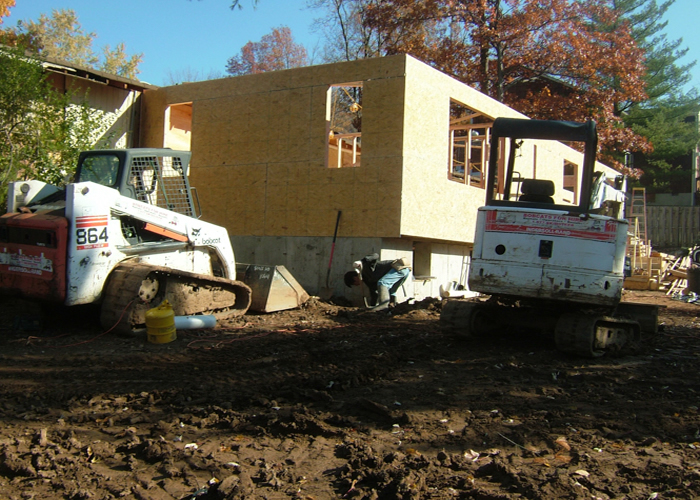 Once complete, this home will never have basement water incursion again. Rock demolition allows the draiange to be installed at the correct elevation. 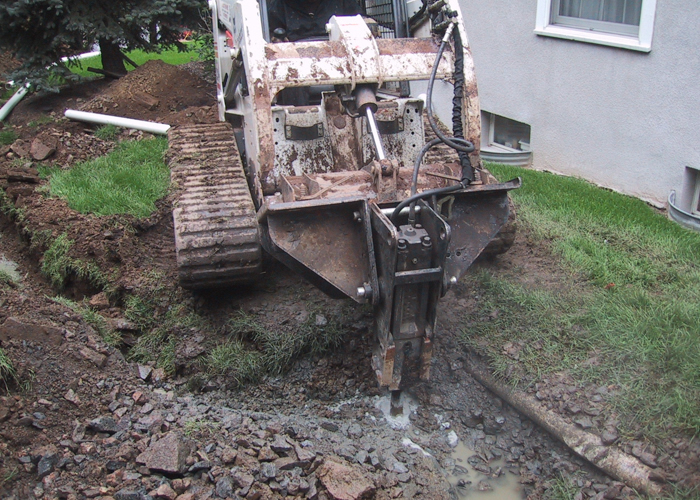 Sometimes site conditions require rock breaking in order to perform a suitable drainage installation. 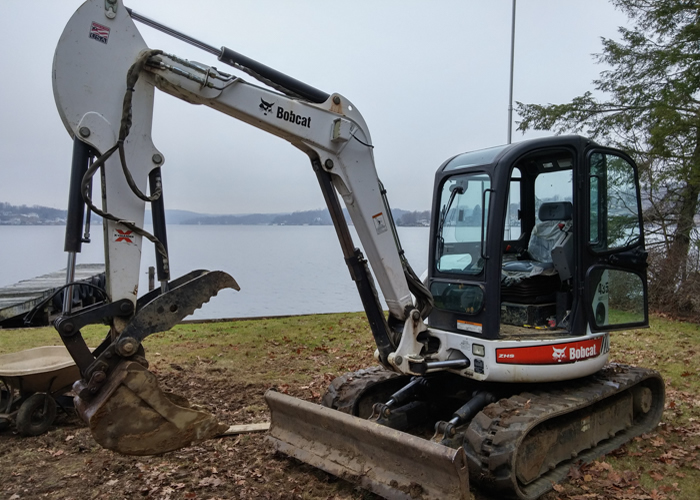 Rather than taking the easy way out, Bobcats for Hire is equipped to demo rock or concrete on your site to ensure that the drainage system works as it should. Installing piping at wrong elevations can be cause for an inferior system. Be smart and hire a team that is prepared for any site conditions that may arise. Bamboo can spread rapidly and cause damage to your home or foundation. 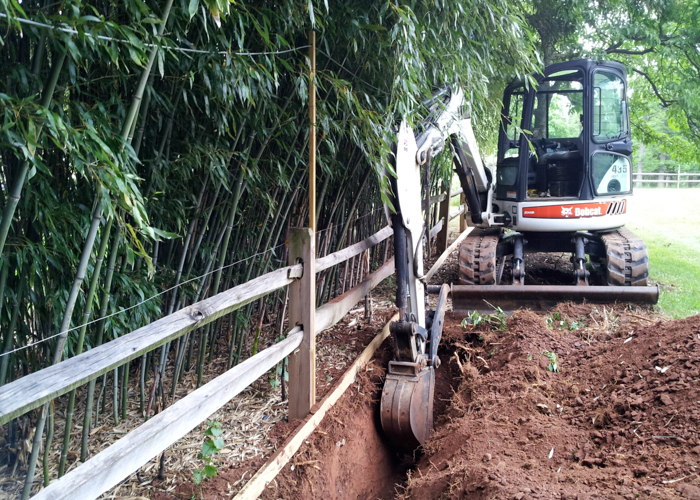 If you are faced with creeping bamboo, installation of a deep root barrier can solve this problem for good. Top soil screening is sometimes a cost effective solution to trucking rock debris off site. 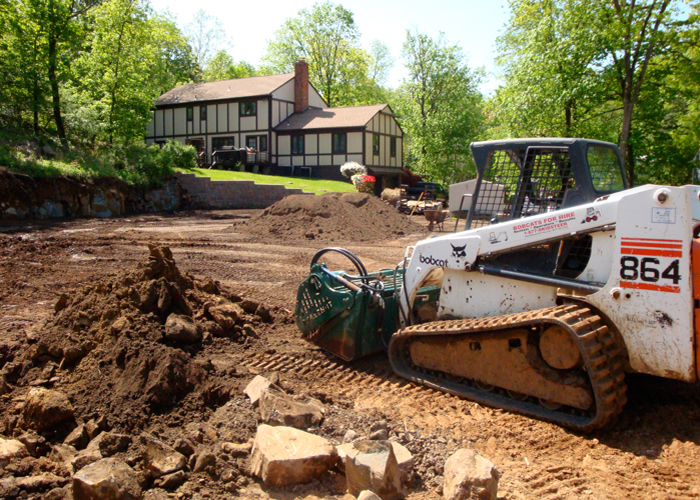 This home required a compact track excavator and loader that could fit through a narrow access to dig out for a new swiming pool. 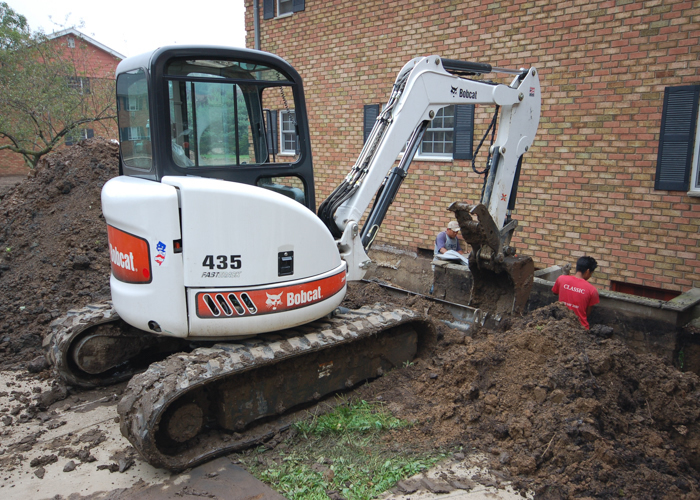 Bobcats for Hire performed the excavation and trucking of the soil from the site to prepare for the new pool installation. This apartment building required an exterior foundation drain and waterproof membrane. 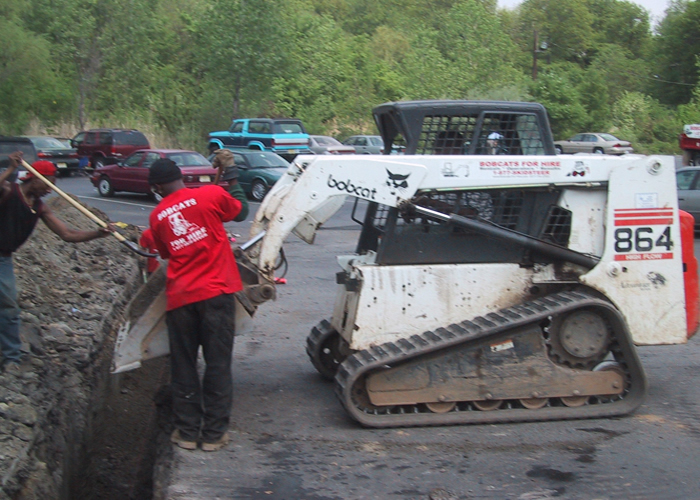 If your project requires fill removal, top soil, or fill dirt, Bobcats for Hire has you covered. Out T300 Remote control bobcats can power through any task that your project demands. Three previous contractors installed an awkward, sunken deck in this customer's yard because they were not prepared to deal with the breaking of the massive ledge rock. Hire an experienced company that can handle the unexpected, and you will be sure to enjoy your project for many years to come. Copyright 2018 Bobcats for Hire Llc. Engineer on Staff All Rights Reserved.